Tomorrow I hop a flight to Tampa via Chicago. I'll be meeting up with Ken Wilson, Jim Mandle, Bill Leuthold and Rob Wilson. Bill is our tour guide. We will be setting out on a tour of mid-western Florida. Bill has charted a course that promises to be just the ticket for a break from my self-imposed crossroads, and timed perfectly to get me in the right frame of mind for the actual move to Toronto. I was originally thinking of a far, far more ambitious ride (Jacksonville to Key West and back, along both coasts), but that turned out to be more that any of us could chew. The key here is that I get to meet these incredible guys, two of whom are Vespa legends. Ken Wilson likely has more touring miles on Vespas in the US and Africa than anyone I know, and Bill and Ken both rode the Hyder Alaska to New Orleans Louisiana Scooter Cannonball in 2014. 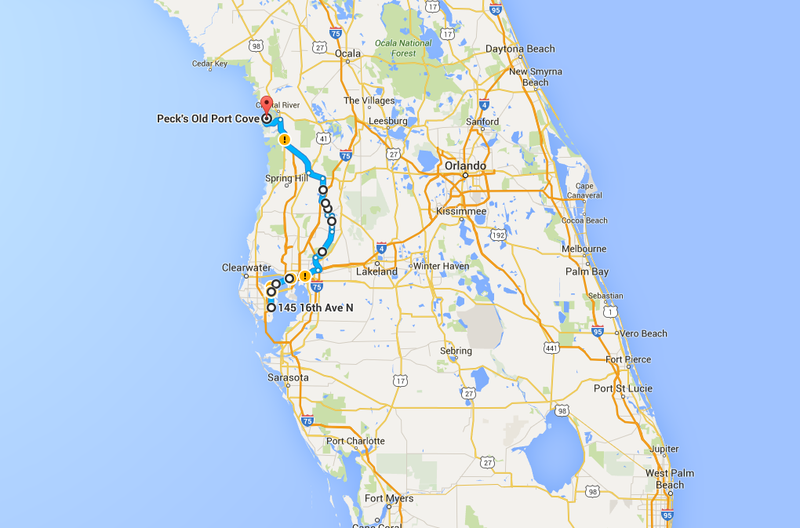 I'll also get an opportunity to meet Rob Wilson as Bill and I ride through his home town north of Tampa. Not to mention the intrepid Jim Mandle, also legendary in his native Adirondacks. I'll be the only non-legend in the group. I am a collector, not a legend. I collect legends, or rather their rider profiles. All I can say to you is to stay tuned folks, as I try to do justice to this trip, to the legends I'll be meeting along the way, and to Kathy's BBBC challenge. Sounds like a wonderful trip David, one that promises some meeting of the Vespa minds and an injection of energy that should carry you on beyond the Toronto move and into summer and some fine riding. Best wishes of a great trip! Thanks Steve for the kind words. I'm really looking forward to this. I'm always apprehensive before one of these solo moto tours. This has the potential to be awesome. Knocking off another piece of Florida! I'm honored to be included. Sadly do to the remodel of our kitchen and a prior commitment I will not be joining this hardy group on their ride. I do however wish them the best of luck and a safe trip as they ride in my little neck of the woods. Awesome, David. I'll hope you guys do a group photo maybe with Scooterbob in it? Enjoy your trip. Have fun David ... perfect time to ride in Florida. Believe me, July is way too, stinking hot.